Instantly sharpen your creative focus and produce great ideas! Give yourself a head start – literally – with this brain-boosting CD. Just pop it on at work when you need to be at your mental peak. You’ll soon be bursting with fresh ideas and insights! The CD begins with relaxing music, designed to calm your mind and de-stress your body. Then listen as the soft music and brainwave tones combine to generate those special frequencies normally associated with creativity. 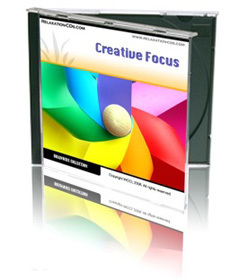 And any time in future you need to give your creativity an added boost, this CD will always be on hand to provide it. It’s safe, it’s natural, it’s non-addictive, and you’ll reap personal and career benefits from it for many years to come! HEALTH DISCLAIMER: Do NOT listen to brainwave entrainment recordings if you suffer from epilepsy, a serious mental disorder, if you are pregnant, if you wear a pacemaker, if you are prone to seizures, if you are photosensitive, or if you are under the influence of medication or drugs. We only advise brainwave entrainment recordings for individuals over 18 years old. Do NOT use brainwave entrainment recordings when you need to stay awake.